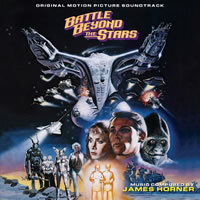 BSXDigitalMusic.com presents the original soundtrack to BATTLE BEYOND THE STARS, featuring music composed by James Horner (STAR TREK II & III, KRULL, ALIENS, AVATAR) for the 1980 science fiction cult classic directed by Jimmy T. Murakami (WHEN THE WIND BLOWS, CHRISTMAS CAROL: THE MOVIE, HEAVY METAL), produced by the great Roger Corman, featuring a script by John Sayles (PIRANHA, THE HOWLING, ALLIGATOR, MATEWAN, LONE STAR) and Anne Dyer, starring Richard Thomas (THE WALTONS), Robert Vaughn (THE MAN FROM U.N.C.LE., THE MAGNIFICENT 7), George Peppard (THE BLUE MAX, BREAKFAST AT TIFFANY’S, THE A-TEAM), Darlanne Fleugel (TO LIVE AND DIE IN L.A., RUNNING SCARED), Sybil Danning, Morgan Woodward, Earl Boen, Jeff Corey, Sam Jaffe and John Saxon (ENTER THE DRAGON, NIGHTMARE ON ELM STREET, JOE KIDD). BATTLE BEYOND THE STARS tells the story of the people of the planet Akir, who have come under siege by a conquering alien race, the Malmori, led by the evil Lord Sador (Saxon). Disrupting their peaceful agrarian existence, Sador arrives in his command ship and issues an ultimatum to the Akira. Submit to his rule or be destroyed by his Stellar Converter, the most powerful weapon in the universe. In an act of desperation, young farmer Shad (Thomas) escapes in a sentient starship called Nell with the intentions of hiring mercenaries to help the Akira defend themselves against Sador and the Malmori. With little to offer in the way of compensation, Shad is able to gather a group of mercenaries, each with their own unique skills and motivations and returns with them to Akir to prepare their defenses. Released in the wake of STAR WARS in 1980 amidst a slew of other imitators, BATTLE BEYOND THE STARS set itself apart from the other films with a charming and clever script that was equal parts STAR WARS and Akira Kurosawa’s SEVEN SAMURAI, sprinkled with THE MAGNIFICENT 7. BATTLE BEYOND THE STARS also gave several key people in the movie industry some of their first jobs, such as director James Cameron, here serving as art director, producer Gale Anne Hurd, serving on this film as assistant production manager, and composer James Horner, whose work in this film helped producers of the STAR TREK franchise make their decision to hire him to score STAR TREK II and III, beginning Horner’s rise to prominence as a film composer. In 1980, at age 26, having written some additional music for Roger Corman’s UP FROM THE DEPTHS and following his first solo efforts on THE LADY IN RED and HUMANOIDS FROM THE DEEP, James Horner prepared to take on his first big film scoring assignment. With John Williams’ STAR WARS and Jerry Goldsmith’s STAR TREK: THE MOTION PICTURE as his barometer, Horner set out to write a large scale symphonic score cut from the same cloth, in the grand symphonic tradition of the composers of the Golden Age. The budget of BATTLE BEYOND THE STARS would not permit the large size orchestra that he had in mind but even with an orchestra of 62 players, he was able to show that he was ready and able to write music on a larger scale. BATTLE BEYOND THE STARS contains all the hallmarks that fans would come to look forward to in James Horner’s fantasy music: a heroic main theme, a pretty violin love theme and much more, chockfull of melody and passion. The digital booklet features notes by author Randall Larson and the music has been newly mastered for the highest fidelity possible by James Nelson of Digital Outland. The music has been re-sequenced into film order for the first time. In addition, available for the first time, is a musical source cue composed by Alan Howarth. Concluding the album and our tribute to James Horner’s seminal composition is an exciting concert arrangement of the main theme from BATTLE BEYOND THE STARS, produced by James Fitzpatrick for Silva Screen Records in 1998, powerfully performed by the City Of Prague Philharmonic Orchestra.